Gibbet Hill Grill, opened in 2004, is set upon a beautiful farm on a hill over looking the city of Groton, Massachusetts (a rustically charming town about 40 minutes north of Boston). The restaurant itself is just as lovely as the surroundings – the exposed beams and Lincoln log structure are reminiscent of the cozy ski lodges I’d frequent during ski season. Due to heavy traffic in our commute out of the city, Fiona and I missed the pre-dinner hors d’oeuvres but arrived just in time for the 1st course – a delightful herb goat cheese stuffed phyllo salad tossed with fresh beans and drizzled with Gibbet Hill’s own honey-lemon thyme vinaigrette. Even though salad is probably my LEAST favorite food item (the only thing I like raw is my sashimi), I was totally blown away by how fresh all the ingredients tasted in this dish! It literally felt like the lettuce had been picked that morning and prepared the same evening. The goat cheese filled phyllo pastry was a bit too rich for my tastes though, perhaps a higher ratio of phyllo dough to cheese would have helped. The next course was the flaky sautéed cod and potato cod cake, served atop sweet and sour kale and a bacon-sherry vinaigrette sauce. This was my favorite dish of the night (gold star award! ), for each tender sweet piece of cod felt succulently sinful as it slid into my mouth and gave me chills (yes it was that good!). The kale also tasted very tender and light, which seemed like an ironic (but welcomed) juxtaposition given the vegetable’s hearty and tough reputation. However, what the kale lacked in innate heartiness was made up for by the denseness of the cod cake. Although small in size, the cake really packed a punch – and I started feeling full after this dish (for it was too yummy to not finish!). The third course of the night was slow-roasted pork accompanied by Red Kuri squash puree, braised collard greens, and Cortland apple chutney. To be frank, when this dish came out, I was a bit turned off by the monochromatic coloring of this dish. All the brownish tones and the general “gloppiness” of the dish were slightly off-putting, especially after its gorgeous cod predecessor. However, never judge a book (or dish) by its cover (or color) – the pork was fall of the bone tender and brought a warmth to my stomach that left it grinning from wall to wall. The apple chutney was also divine, and gave the dish a nice tartness that complemented the pork nicely. The last dish of the night was a moist honey cake topped with vanilla ice cream and poached apples. By this point, the seams of my stretchy skirt were about the rip, but I love dessert and couldn’t resist indulging one last time. The honey cake, made with honey from the farm, was fabulous – the honey gave the cake a natural sweetness that didn’t feel cloying or fake (i.e. high fructose syrup-ish). After this fulsome meal, I’ll probably be camped out in the gym for the rest of the week…but I’d do it again in a heartbeat! 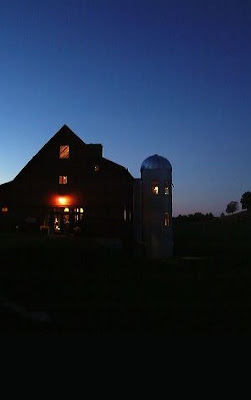 Seriously, I encourage all of you readers out there to enjoy a farm dinner at Gibbet Hill (or any other farm) before you pass on – it’s a wonderful way to connect with food and really experience the best of what nature has to offer! Have you been to Blue Hill? This place sounds very similar. I am going to have to try this place next time I am in Boston! @Carrisa no but a Team FF writer has and wrote abt her experience there! Can't pick strawberries in October, apples yes. The Herb Lyceum in Groton is hosting a Feast of the Forest October 12, 2010 for those wanting that farm dinner experience.